Well, here's my version of the scene where the poor fellow has his heart torn out. He has my condolences, but it seemed getting burnt to death was actually the worst part for him. I have mixed feelings about this MOC, from a mediocre success with lighting, to running out of pieces and other details I am not satisfied with. But, I hope you like it! Took me longer than I anticipated, being quite huge! 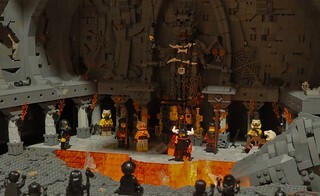 I got inspired to build it seeing BrickBuilder7622's awesome vignette series on Indiana Jones.